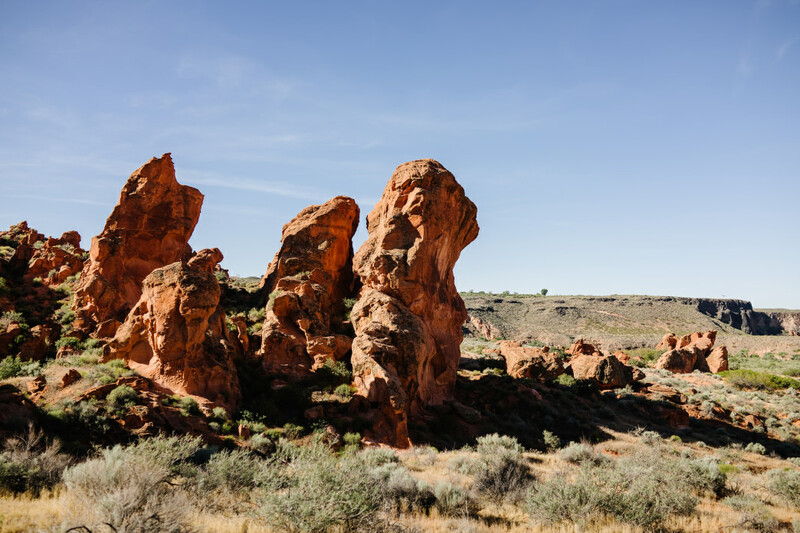 This extraordinary nature reserve outside St. George, Utah, includes three major sections at its eastern end. Each bears its own variety of untamed rock formations, sweeping vistas, and countless interesting trails to explore. The eastern reaches of Red Cliffs Desert Reserve include multiple sections of the reserve: White Reef, Sandstone Mountain, and the Hurricane Cider Knolls. Each of these zones holds its own flavor of desert textures, vistas, colors, and experiences. As is often true of the red rock desert, there’s a lot going on that you have to slow down to see and feel. Dramatic rock formations are the first thing you tend to notice, but as you cover miles of trail, you gain an appreciation for the resilient desert grasses, hardy wildflowers, fresh-scented sagebrush, intrepid lizards, and ambling little streams. 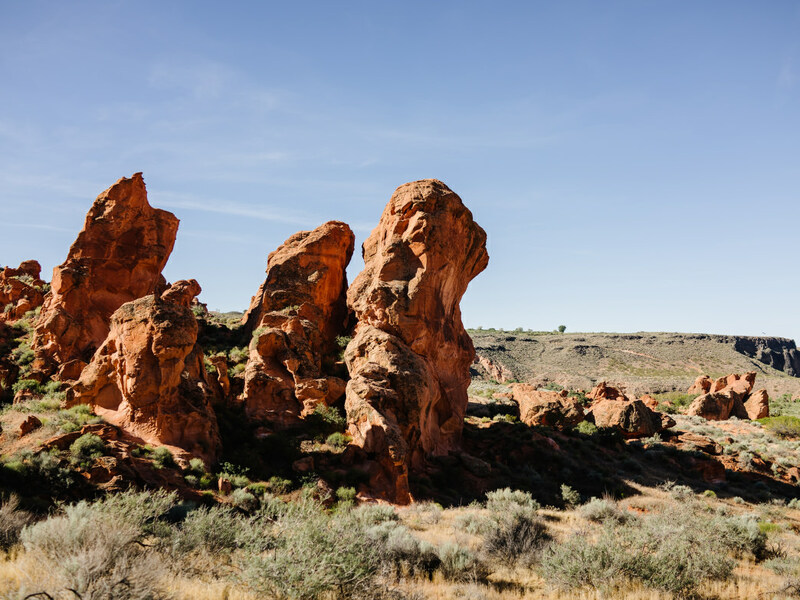 If you do one thing in the eastern end of Red Cliffs Desert Reserve, it should be the Red Cliffs Nature Trail. This is no tame nature walk; it’s a ramble into a twisting rock canyon with pools of delightful flowing water you can stomp through and swim in. A leisurely desert waterfall serves as a major landmark a short ways up. Many people stop here to play in the swimming hole, but there’s no need to end your ramble there. You can scramble up the waterfall’s sandstone edge and continue onward as long as you like. This is one trail you can tolerate even on hot days, as long as the stream is still running (it may not be by summer’s end). If you explore the next area eastward, you’ll find the Babylon area is indeed biblical in its proportions. Winding sandy trails and fascinating, otherworldly rock formations bedeck the rolling desert landscape. Babylon has a certain wild edge to it: the trails are exposed to the sun’s full potency all day, and even the access road to the trailheads is nothing to sneeze at, requiring four-wheel drive or all-wheel drive to access most points. If you’re up for the undertaking, this fascinating scene is well worth exploring. If you happen to be traveling with your family or are a less experienced hiker, then the Babylon Arch Trail is where you should head in this area. It’s a quick 1.5 miles and goes through a fascinating rock arch on its way to the Virgin River. And, representing the Hurricane area at the easternmost reaches of the reserve, you’ll find the East and West Cinder Knolls. They’re geologically interesting, true to their names — they’re volcanic knolls jutting up above the little desert town of Hurricane (which locals pronounce more like "her-kin"). While these cinder cones aren’t as flashy as some Red Cliffs Reserve trails, they’re unique: The west cone is especially colorful, being comprised of a rich, dark red and black cinder pile that’s fascinating to walk across. You’ll get a little workout in by gaining hundreds of feet on the way to the caldera overlooks. And you’ll be able to check out the vast glory of Sandstone Mountain, also a part of the reserve, as well as the Pine Valley Mountains. 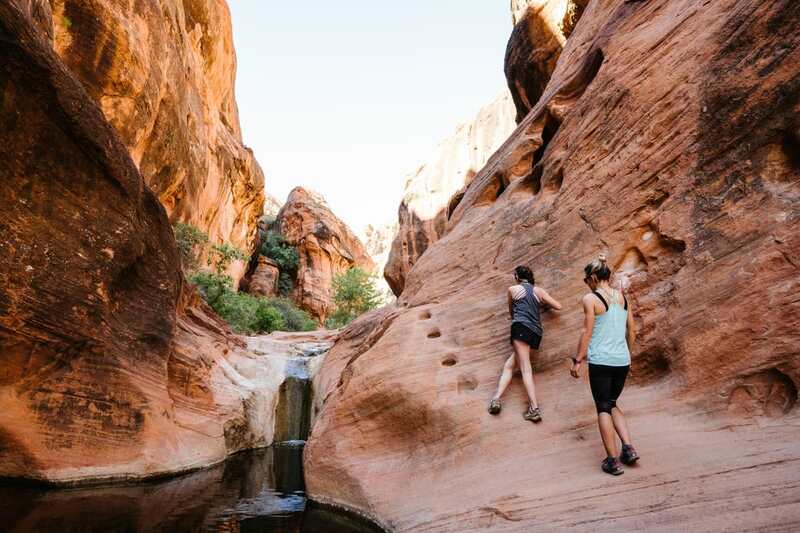 Wherever you go within the wondrous Red Cliffs Reserve, keep in mind that safety is no joke in the desert. Simply running out of water or getting lost on a hot day can gets truly dangerous quickly. Always carry far more water than you expect to need, monitor the weather forecast, and keep a close eye on how pets and children are doing. Carry a map you know how to read, and give local wildlife a wide berth. Get a refresher while looking out over local geology at the River Rock Roasting Company, perched over the Virgin River gorge. Written by RootsRated for Utah Office of Tourism.